Before those long hours of studying during finals week, find a study spot at Mizzou Libraries. We have spaces for everyone. If you like dead quiet, check out rooms 201 and 202 at Ellis Library. Check out this Ellis Libray floorplan to see all the quiet spots. Journalism also has four private personal study pods on the bottom floor that are first come, first served. But if complete silence isn’t your thing, try the Information Commons (or the first main floor of Ellis Library). There is always The Bookmark Cafe on the ground floor for coffee and conversation as well. If it’s a group study spot you are searching for, try to reserve one of the group study rooms in either Ellis, Engineering, or Journalism. They can be reserved for up to two hours for each group. But remember, it’s best to plan ahead. They fill up quickly! The Health Sciences Library also has a small number of study rooms on their third floor reserved for people enrolled in health-related programs. 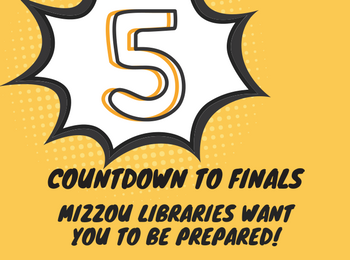 Remember, if your program has its own library, be sure to check out those spaces, as they are often designated specifically for you! Every student at Mizzou has many accounts they need to keep track of, and some of those accounts can help you out at the Mizzou Libraries! Know the status of your Print Quota. Make sure you have money left if you need to do a lot of printing! If not, it will send the charges to your student account. To check the status of your Print Quota, click the link and log in with your username and password. You can also request refunds from this site if your print didn’t come out correctly. Another account to keep in mind is your MERLIN Account. This is the account that keeps track of all the books and materials you have checked out from the Mizzou Libraries or MOBIUS. If you have anything checked out through Interlibrary Loan, you can see that information by logging into your separate ILL Account. Something else you always want to bring with you to the Mizzou Libraries is your Student ID. After 10 pm this is how you are granted access into Ellis Library, and this is also how you check out supplies during all hours the library services are open.